2016 has taken a lot of well known people, none of which I met personally but whose work I enjoyed and inspired me in different stages of my life. Hadid was important to me early in my career. In the early 90s during my transition from architecture to graphic design, her work and philosophy inspired me to make decisions and helped me define the career path I needed to take: visual communication. It is impressive to realize to what degree her 1980s drawings influenced so many, not only architects but artists in general. For me they were a catalyst, I was exposed to her work during my 2nd year of architecture school during the time when I realized architecture wasn’t the career I wanted. Thus, I took a break from school and began working at the American Institute of Architects (AIA) in Los Angeles as a “Contract Document Specialist”. With nearly 300 state and local offices, the AIA serves as the voice of the architecture profession. They set the industry standard in documents with more than 100 forms and contracts used in the design and construction industry. I really enjoyed this job. I was certain I didn’t want to be one of them, but that didn’t mean my passion for architecture was dead. On the contrary, my appreciation grew and took a different meaning. I worked and discussed projects with architects on a daily basis, I learned a lot about building codes and the bureaucratic side of the profession, I learned to deal with demanding ego-centric clients. It exposed me to the Los Angeles architecture scene of the 1990s. I couldn’t have explained it better. I recall staring at her hands, perhaps due to being intimidated or star-truck, and being memorized by her jewelry. Like everything about her, it was big, bold, strong. 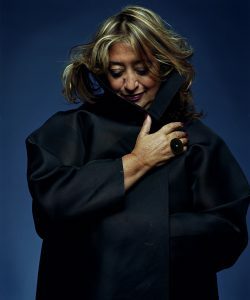 Needless to say, Hadid led and commanded the conversation, everybody listened attentively and I’m sure was grateful to have worked, even for a few hours, with a design icon of our time.